The PASTRY FOR CROISSANTS, CROISSANT, brioche browse and much more: prepare the pastry dough at home, so you have a nice fresh croissant in the morning (Since the raw frozen croissants will keep well for two weeks), It is not difficult, especially if you have a food processor or a planetary mixing container. The procedure is the same as the classic puff pastry, but the crayon has risen and the recipe that I leave is that of the French Master Pastry Chef Michael Roux. Your croissants are perfect. Here are the ingredients for about 16 brioche. Dissolve yeast in milk. If you have a kitchen appliance, put the flour salt, the sugar in the robot and start kneading, pouring in the milk with yeast. The mixture is ready when it is detached from the sides of the Bowl. If you don't have the robot, you have to knead by hand. Cover the dough with plastic wrap and leave to rise in a warm place for about an hour: the dough should double in volume. Once you have risen, Knead for a minute or two to hand the mixture and refrigerate for 4-8 hours. At this point, flour the work surface and the dough but. Give him a ball and cross incidetelo to a depth of three centimeters. With a rolling pin, roll out the dough from the Center to the corners of the four extremities, to form four small wings. Take the stick of butter and crush with a rolling pin until it becomes a rectangle top two centimeters. Fold toward the Center lugs on the stick of butter until you close it. By now the procedure is the same as for puff pastry: you have to make three rounds in three layers. First ride: roll out the dough on the floured surface, in a 60 x 30 cm rectangle and fold in three. Wrap the dough in plastic wrap and store it for 30 minutes in the pastry refrigerator. Follow the same procedure for the second and third rounds. 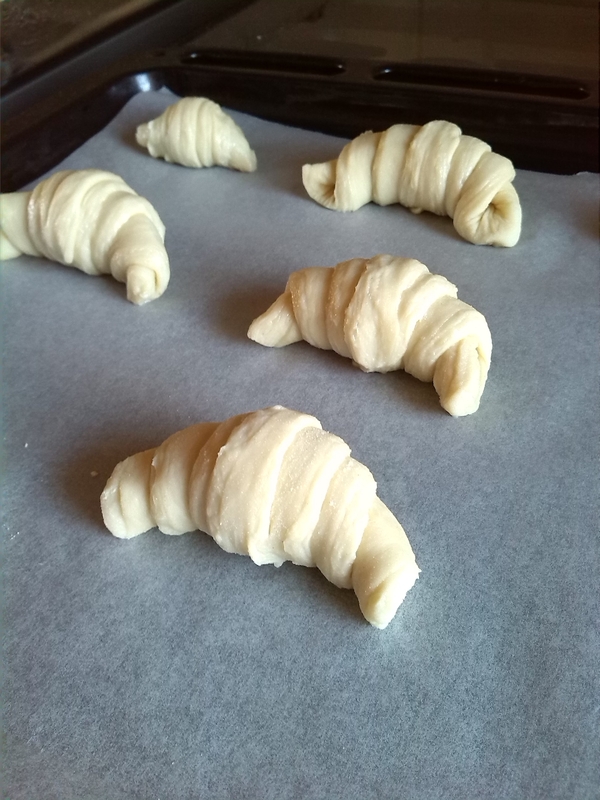 After the last rest in refrigerator, at least 30 minutes and one hour maximum, croissant dough you can use to make croissants, pain au chocolat, little bags filled with cream, swivels with raisins or whatever your imagination suggests you. 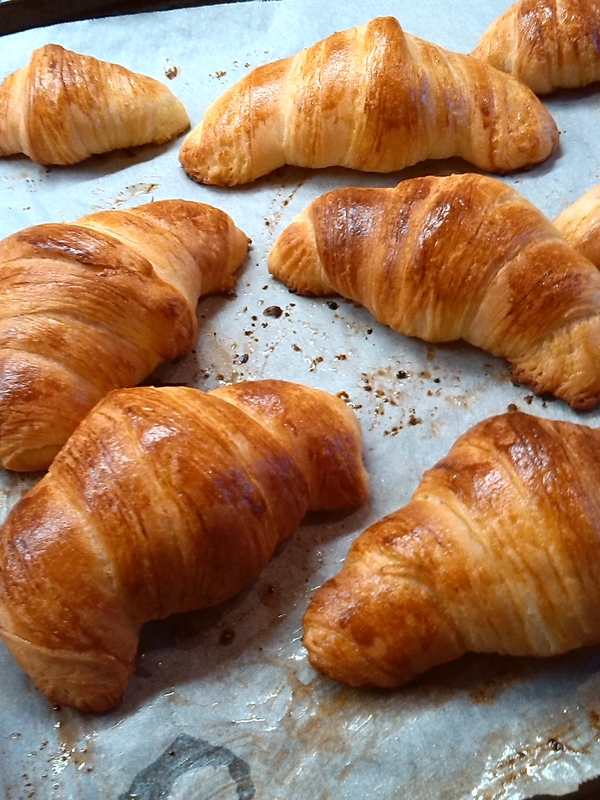 For baking croissants, Preheat the oven to 170 degrees and bake in preheated oven for 14-16 minutes.